Melt the butter in a large sauté pan set over medium low heat. Add the onions and sauté until caramelized, about 35 minutes. Season to taste with salt and pepper. Cut off the top portion of the head of garlic exposing the insides and discard. Place the head of garlic on a small sheet of tin foil and drizzle with olive oil. Sprinkle with salt and pepper and wrap the foil around the garlic forming a pouch. Bake in a 400 degree oven for one hour. Unwrap the garlic and let cool. Squeeze the roasted garlic into the caramelized onions and stir to combine. Add the braised beef, season to taste with salt and pepper and set aside. Cook the lasagna noodles in a large pot of salted water until al dente, about 8 minutes. Be careful not to overcook the noodles as they will continue to bake in the oven. Drain the noodles and set aside, separating them so they do not stick together. In a large bowl, combine all of the shredded cheeses and toss. Open one of the jars of marinara sauce. In a 9x13 baking dish, ladle in one cup. Add 5 noodles, then sprinkle 1/3 of the beef mixture atop the noodles. Sprinkle 1/3 of the cheese mixture atop the meat then spread ½ of the ricotta cheese, pressing to compact the layers. Sprinkle with one teaspoon dried oregano. Repeat this process with one cup of additional sauce, five more noodles, 1/3 of the beef, cheese and the remaining ricotta. Sprinkle with the rest of the oregano. Finish with the remaining sauce, the last five noodles the remainder of the beef and top with the rest of the shredded cheese. Bake in a 350 degree oven until hot and bubbly for one hour. Let cool for 15 minutes and cut into servings. Place the contents of the second jar of marinara in a small saucepan and warm over medium heat. 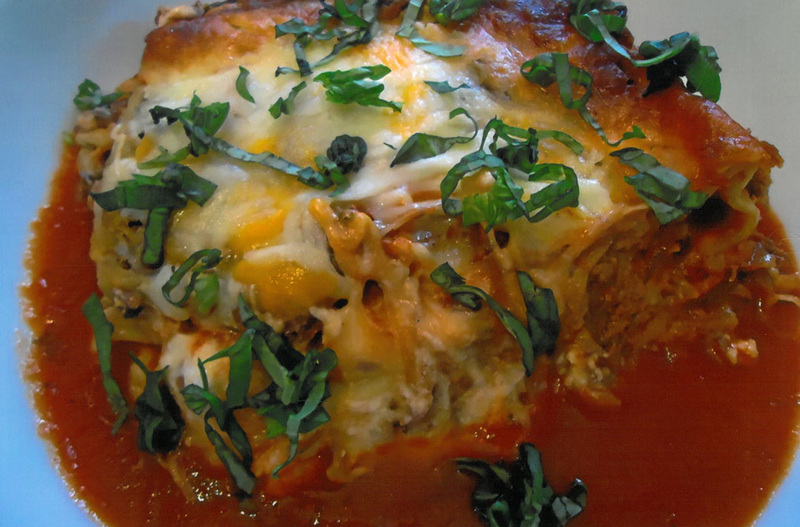 In a shallow bowl, add 3 ounces marinara sauce and then top with a piece of lasagna. Garnish with fresh basil.